Post-launch updates are supposed to make a game better, but some players now believe Red Dead Redemption 2’s graphics have been slightly downgraded following the release of the most recent patch. They have been sharing before and after screenshots to try and prove it. Rockstar Games released Title Update 1.06 on February 26. It introduced new items and tinkered with stuff in the online mode, like adding new daily challenges and making it easier to identify players that were potentially griefing other people. 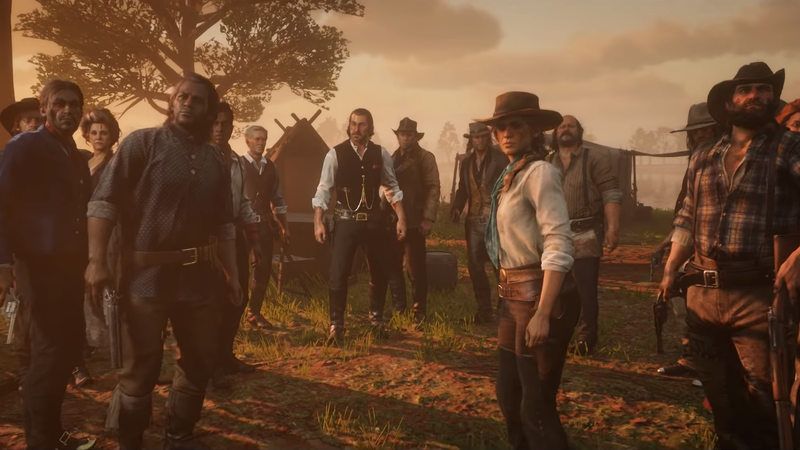 The single-player campaign was seemingly left unchanged, but some players are now saying they see less detail and poorer lighting in some areas of the campaign. Other players think that’s wrong and are countering with their own before-and-after shots. On March 13, a player going by Darealbandicoot‏ on Twitter tweeted an alleged comparison of the inside of a saloon between when the game launched and now. The first image is clearer and has a more striking contrast between the shadows and highlights on objects, while the latter looks a bit foggier over all. There are also some things missing in the post-1.06 screenshot, including one of the non-playable character’s pocket squares. Other players have argued that the changes can be accounted for by differences in the time of day between the two shots, and that the second shot was potentially doctored to look worse. In response, Darealbandicoot shared a second comparison shot involving customizing protagonist Arthur Morgan’s clothes. There are still noticeable differences that wouldn’t be caused by the time of day, like fewer shadows on the folds in Morgan’s clothes and the floorboards in the cabin he’s in. Darealbandicoot did not immediately respond to a request for comment about the shots..
[Update -9:43 p.m.]: In an email, Darealbandicoot told Kotaku the their screenshots were shared directly from a regular PS4 after seeing players discuss the discrepancies on GTAForums. Another comparison point has been the game’s street cars. A handful of shots comparing them pre- and post-patch show similar differences in the lighting, with supposedly fewer and more shallow shading effects on the side of the cars in the current version of the game. There’s also a before and after shot of a hallway which looks practically identical at first. Upon closer inspection though it’s clear the lamps lining the walls in the first shot shine more brightly and warmly on the parts of the wall immediately behind them. How a hallway appears in version 1.0 (left), compared to version 1.06 (right). Other players have come forward with shots that appear to show that some of the changes in the lighting effects might go back even further to the Title Update 1.03 from November 29. In a thread posted on the GTA Forums that same day, some players mentioned differences and talked about trying to re-download the original version of the game to revert back to the earlier graphics. Rockstar Games did not immediately respond to a request for comment. These lighting effects in games tend to be associated with ambient occlusion rendering. In PC games there’s usually an option to turn it off in order to run a game more smoothly on a less powerful graphics card. Some players have speculated that the visual downgrades are an attempt to make Red Dead Redemption 2 run more smoothly on base PS4 and Xbox One models. It’s also possible that the visual changes are simply a bug. The 1.06 patch notes list dozens upon dozens of bug fixes, some aimed at things like lighting effects. “Fixed an issue that resulted in incorrect textures and lighting effects on some combinations of player clothing,” reads one. It’s possible that there’s no problem at all, and the differences in screenshots can be accounted for in differences in the time of day or weather, both of which are associated with lots of nuanced, visual changes in the game. The act of compressing images down to share them online could also be partly responsible for at least some of the apparent changes. Whatever the cause, it hasn’t made Red Dead Redemption 2 look ugly by any means. The game remains a technical marvel. It has, however, led to a new contingent of the game’s most diehard fans committing themselves to going back to the 1.0 version of the game and not installing any future updates.